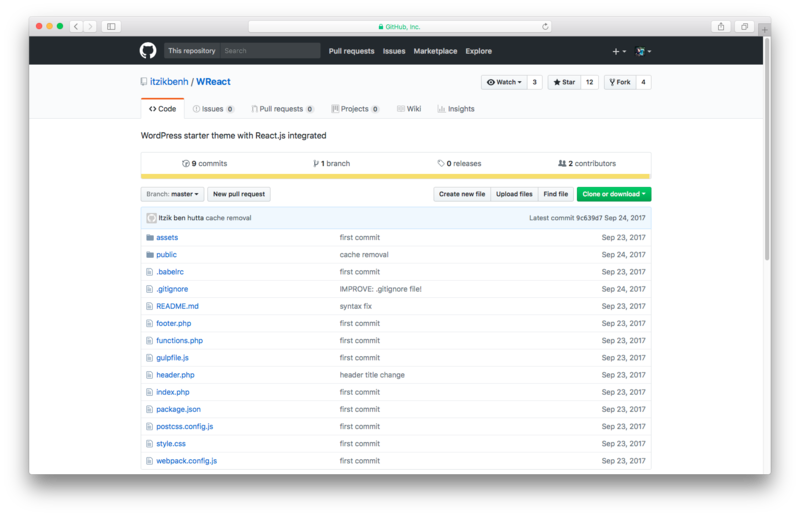 In this post, we’ll take a look at 10 WordPress themes built with React JS. A lot of them are on Github and still in development, but we found a few with live demos. They are just the start of what is possible with React in the context of theming. Frontity PRO is a mobile theme built on React for WordPress blogs and news sites. It implements Progressive Web App technologies and uses the REST API to fetch the content, along with a WordPress plugin. With a clean design, Frontity is specifically designed to improve your blog performance and speed, making your site load in less than one second. In addition, it supports Google AMP and can be integrated with OneSignal Push Notifications, Disqus, Yoast SEO, Google Analytics, Google Tag Manager, AdSense, DoubleClick for Publishers, and other ads providers. 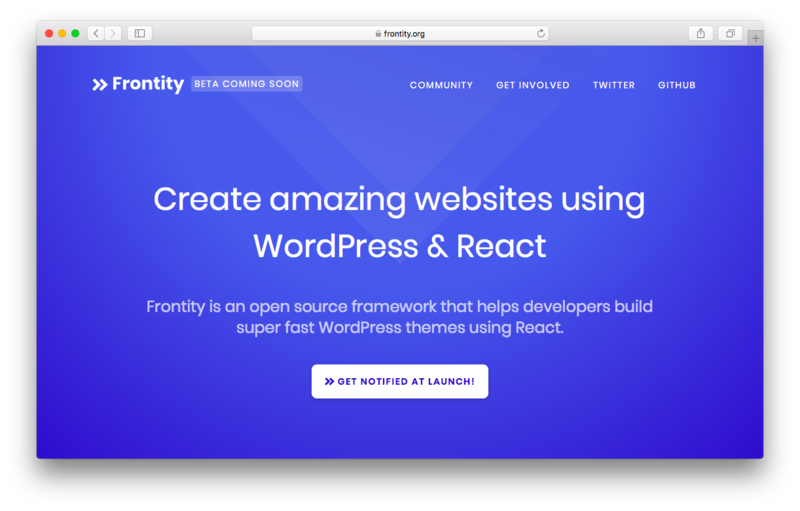 [UPDATE] Right now, Frontity is open sourcing the internal framework they’ve been using to power news sites so that any developer can use it to build WordPress themes with React in an easier way. You can learn more here, get notified when beta version is released or check out their Github repo. Suitable for all types of business, React is a practical solution for a modern and clean website. It provides you with multiple responsive layouts to choose from. With a user-friendly interface, the theme has ready-to-use color schemes to suit any design style and modify colors with ease. React comes with Visual Composer, Slider Revolution, Go Portfolio, and its own Quform. It is also compatible with plugins such as WooCommerce, W3 Total Cache, and WPML. Among other features, the theme includes some performance tools to help speed things up as well. You can see a live preview here. 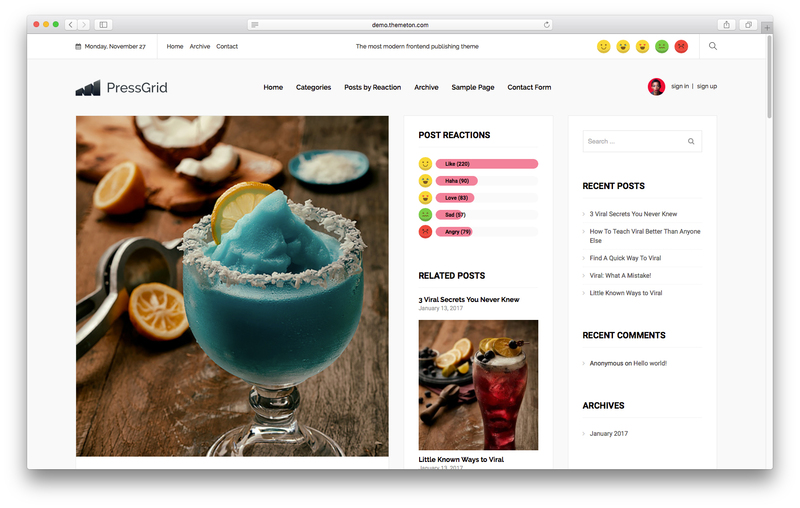 PressGrid is a modern frontend publishing and multi blogging theme, which means that everyone can post on the site. With unlimited color options for posts and a responsive layout, it allows post reactions and has a social login section for users to publish from their Twitter or Facebook account. PressGrid also supports different multimedia post formats such as video, audio, link, quote and status (Twitter, Instagram). See the live preview here. This is a photography WordPress theme built entirely on React. It is mainly focused on performance. To speed up the navigation, it uses pre-caching and download the content your visitors might access before they even access it. Almost everything in BeesWax is customizable. It comes with a simple front-end user interface that you can adapt to your needs with just a few clicks. You can also visualize your changes in real-time without having to keep refreshing the page. Check out a live demo here. 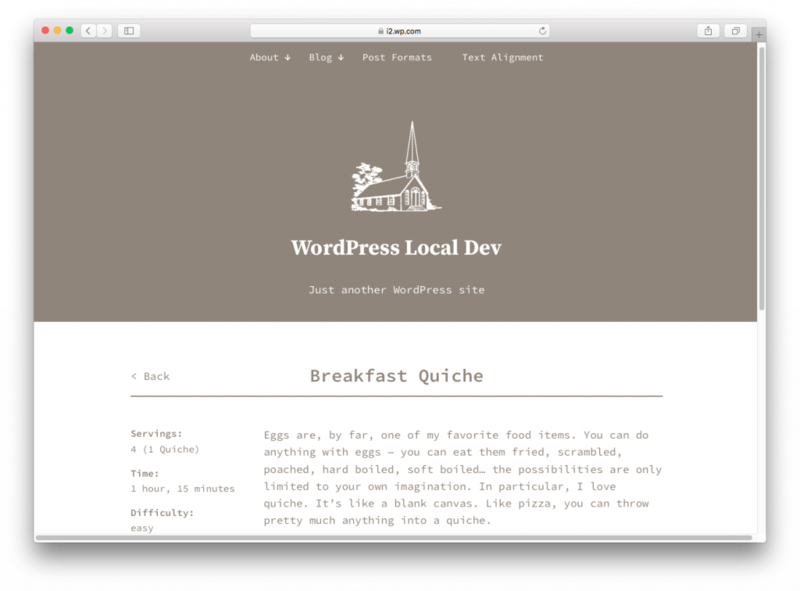 Anadama is a React-based recipe theme for WordPress. It was designed as a simple blog to display recipes in a vintage book style. It has no comments or widgets, just a list of post titles on the homepage and a pop-up card with the recipe content. Anadama-React was a small project to see how React JS could fit into a WordPress theme. If you want to check it out, the Github repo has instructions to set it up yourself. The developer of Anadama, Kelly Dwan, also built this “experimental” text-focused blog theme for WordPress in React JS. 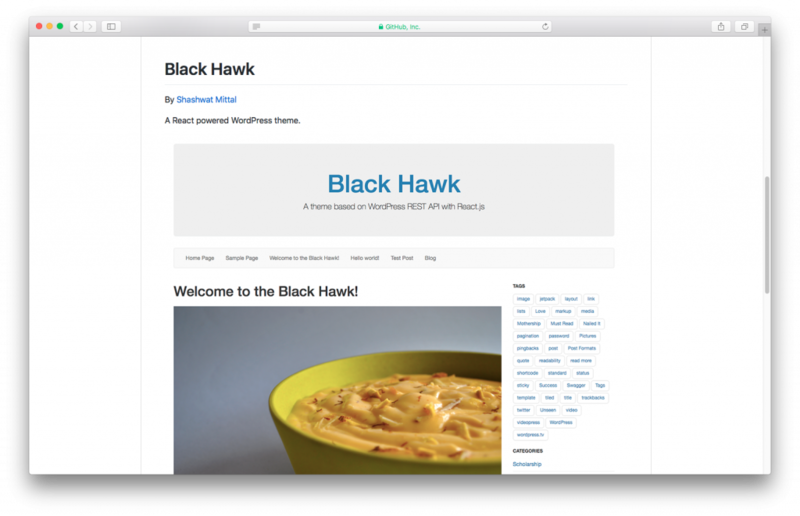 This was the first REST-API-powered theme on wordpress.org. 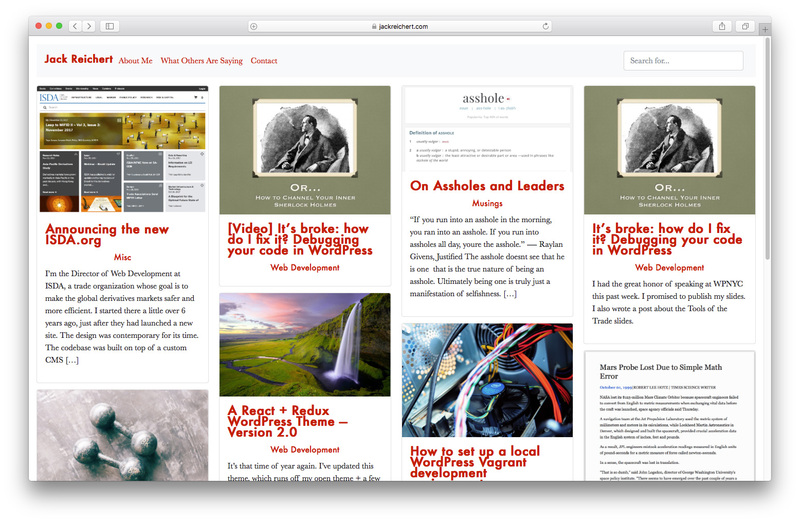 As per her author, the theme looks best with “Front page displays” set to latest posts, but it does support a static page and blog posts on another page. It displays featured images on single posts and pages, but not on archive/list views. 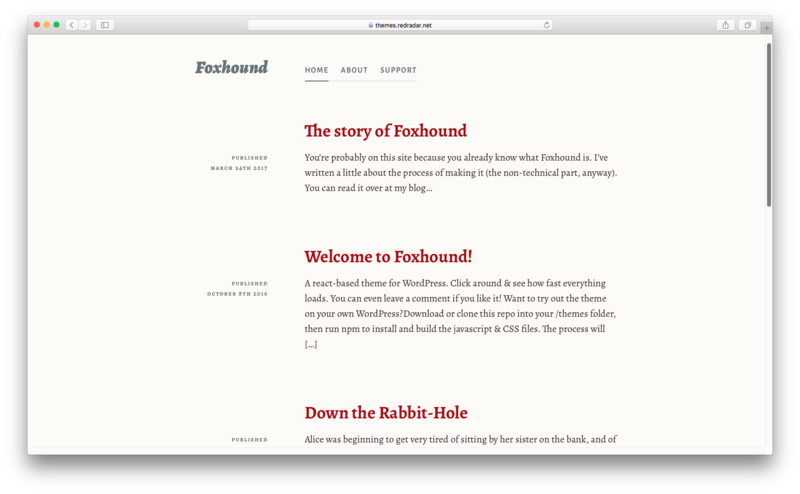 To learn more about Foxhound, check out the project on Github. 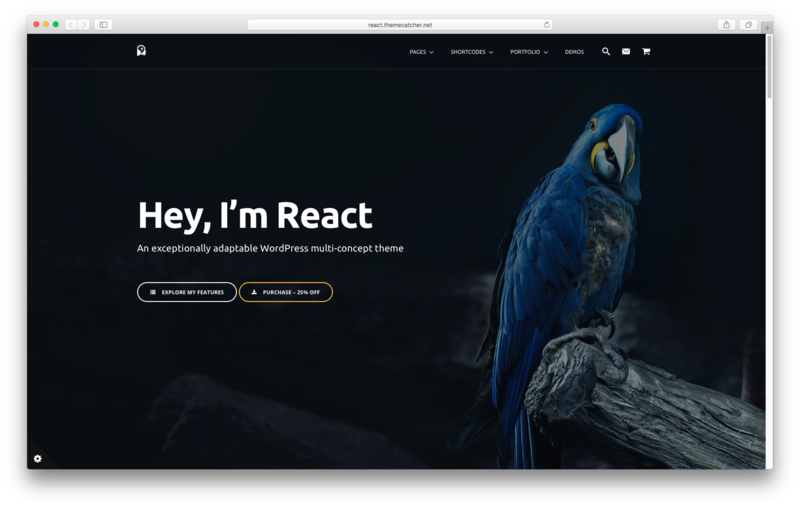 This is a WordPress starter theme with React JS integrated. 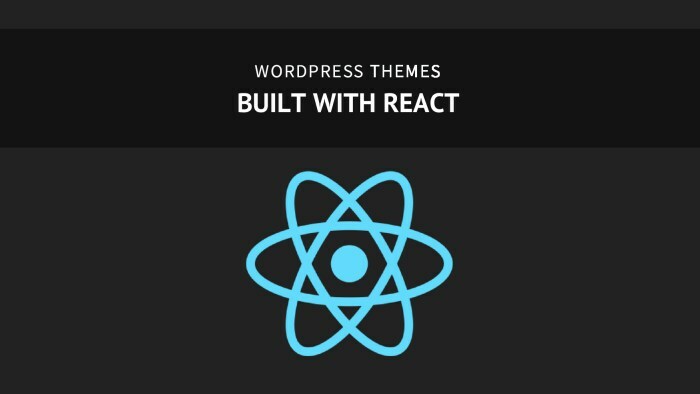 It’s meant for you to learn React inside WordPress or to create your own theme. Visit the Github repository here. As a starting point for your custom WordPress + React + Redux web applications”. You can go to the Github repo or read a tutorial on his blog. In this React-based WordPress theme all the data is fetched using WordPress REST API and rendered using React. It uses Bootstrap for styling its views and components. Learn more on Github. 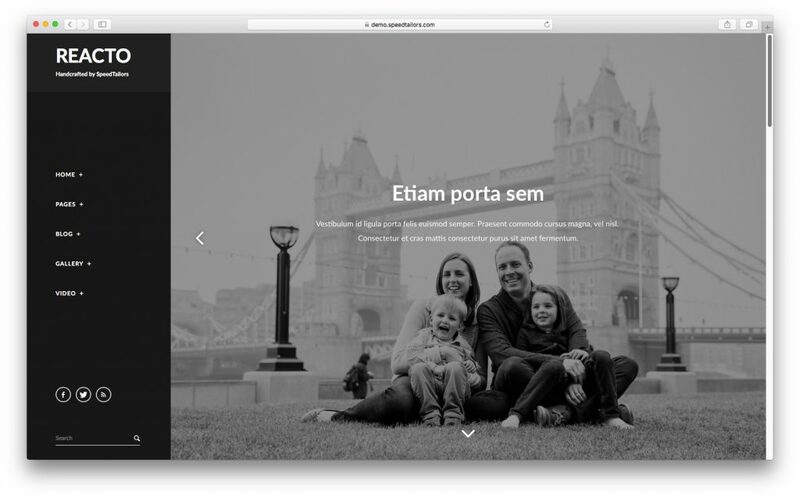 This is the last WordPress theme built with React JS in our selection. Its features include: dynamic menus (main menu + footer menu), category archive pages, search, tags, Bootstrap 4, threaded comments, etc. You can check out the project on Github or see the live theme on the author’s personal site. Some of these themes are small projects in development and others were just an experiment. 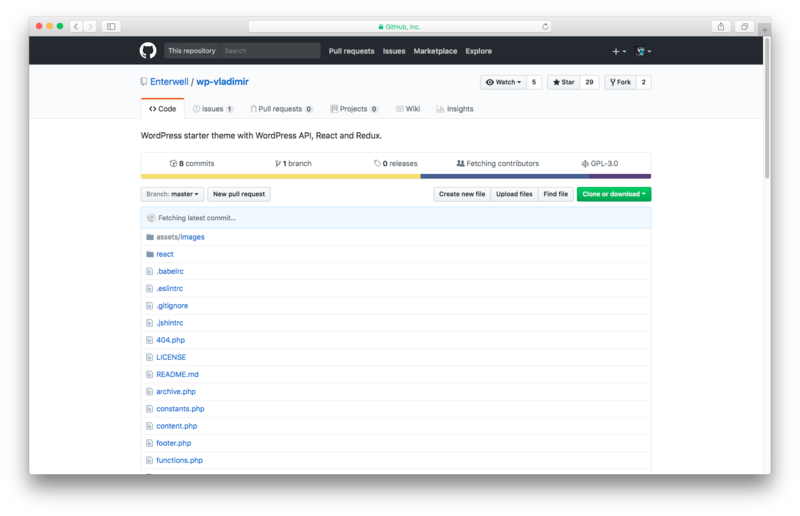 But they all are a great way to learn about how React can be used with the REST API to create better and faster experiences with WordPress. As mentioned above, it opens a world of possibilities including storing and pre-fetching content, animations within themes, and the ability to create offline experiences using Service Workers. These advances are receiving a lot of of attention from developers who are improving their performance and expanding their functionality. Do you know any other WordPress theme built with React JS? Feel free to share it in the comments section below!